Seemingly from out of nowhere, Andrew Lloyd Webber, who we might expect to be a little distracted by his ‘babe’ Nicole Scherzinger performing in the recently revived Cats, has announced that he is on a visionary mission to restore churches to the centre of their communities once again. The key to this ambitious plan is to fit our church buildings with Wi-Fi and make it available to the general public. And just in case any church treasurer might be getting a little nervous at the thought of finding the funds to implement such an initiative, Lord Lloyd Webber’s intention is that government stumps up the cash. Apparently, he’s been discussing his proposal with Culture Secretary Ed Vaizey, who is reported to be actively considering the project. “We are keen to ensure our heritage is preserved,” he said. Centuries ago, churches were the most dominant buildings in their towns and villages. They weren’t simply used for services – the naves would ‘belong’ to the parishioners and played a central role in hosting all sorts of secular activities. With the installation of pews, much of this ceased, so when Lord Lloyd Webber talks about a curious juxtaposition of returning to medieval traditions and providing 21st-century communication technology, how exactly would it work? 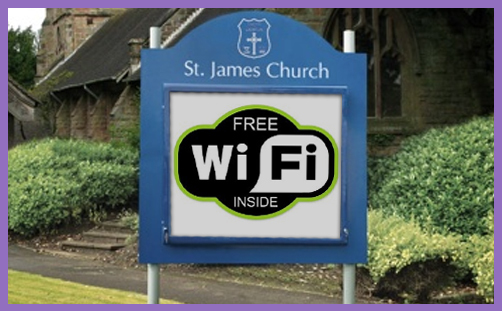 Even for churches which have done away with their pews or are modern enough not to have them in the first place, what would the benefit of free Wi-Fi be beyond simply allowing congregations to check Facebook more easily when the sermon starts to drag on a bit? Talk of installing Wi-Fi suggests that no one has thought of this already (at least from the Daily Mail‘s point of view). Even though there are still some churches for whom the thought of having a flushing toilet is a novelty, it shouldn’t come as a surprise that there are plenty which are offering a digital connection to the rest of the world. There is one church in particular that I have been visiting for over 30 years, and which has used Wi-Fi to great advantage. When I was young we would regularly visit Polzeath on the north coast of Cornwall. On the other side of the road from the beach stood the Methodist Chapel, which would draw in many visitors, but the regular congregation was made up of a diminishing number of very committed but mostly elderly members. By the early 2000s the end was nigh. The few remaining members had a decision: either sell the chapel for a decent sum, or find someone with a vision to take it in a new direction. 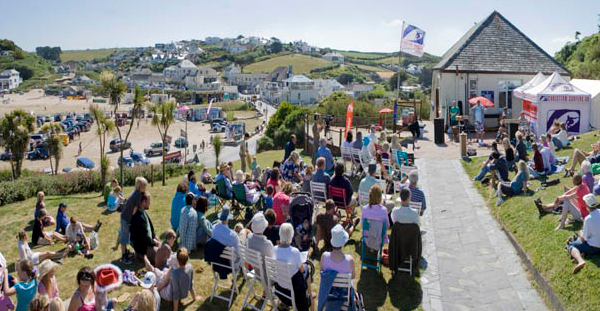 Convinced this was not the end of the road, in 2007 the chapel was handed over to a pair of Christian surfers who had a heart for the local community. 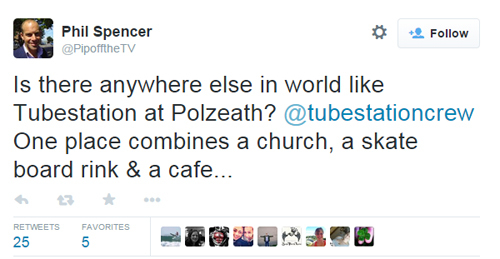 It was renamed Tubestation, turned into an internet cafe during the week, and had a skate ramp installed. By offering the only free public Wi-Fi in the town and a place for visitors and locals to relax, it has developed into an important hub for those living in the area. 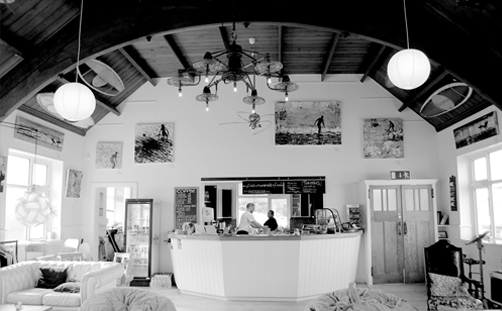 It now has an art gallery with local artists, its own blend of coffee, and hosts the annual ‘Jesus Longboard Classic’ surf competition. Service attendance continues to grow, as does its reputation. Location, Location, Location‘s Phil Spencer is a big fan and regular visitor. I continue to visit Tubestation regularly, and it’s been quite incredible to see it develop and grow, becoming the sort of church that Andrew Lloyd Webber is probably talking about. It is valued by many people who would not normally have any intention of going near a regular church, and by doing so they have discovered that the Christian faith has meaning and relevance. In this case, the Wi-Fi is just a small part of the jigsaw that makes this church so vibrant and engaged. If the Lloyd Webber plan ever comes to fruition, the whole concept of Church Wi-Fi will only be of any value if churches actually do something proactive with it. In its own way it will act as a potential catalyst for them to reach out and offer something bigger that can bless their communities. It will only succeed, though, if churches have an understanding of the needs around them, and the vision to put something together that is dynamic and relevant to the 21st-century lives of those who visit. Traditionally, churches tend to lag behind the prevailing culture and technologies, often playing catch-up when it comes to taking advantage of the opportunities on offer. The gospel has no need at all to be tampered with – God’s truths are eternal – but the method of delivery needs to updated with every generation if the message is to be effectively presented. Andrew Lloyd Webber is no fool with a harebrained scheme: he sees the potential for churches to be vibrant and provide the lifeblood for the communities around them. The more we see the lead of pioneers such as Tubestation being followed, the greater the likelihood that churches – and the Christian faith – will regain local prominence and community approbation. And if free Wi-Fi comes as standard, then that just makes things better still.